Picture me at the grocery store. Gleefully skipping across the produce section like a kid at the playground, ticking off everyone else who might be wondering why, on Earth, I’m skipping in a grocery store. What can I say? Produce makes me happy. Anyway, off I go. Blissfully filling my basket. I’m not even gon’ traumatize you with how much the beefy tomatoes cost. Let’s just say… I still have nightmares. Why are the grocery stores expecting me to pay an arm, a leg and a first born for tomatoes? Freezing weather across the South and in Mexico recently damaged tomato, cucumber, and bell pepper crops, leading to shortages and price increases. That has left some restaurants scrambling to revamp their sandwiches and salads, and smaller quantities of some produce at many grocery stores. For tomatoes, in particular, it’s unusual to have freezes in both Florida and Mexico in the same season, said Reggie Brown, executive vice president of the Florida Tomato Growers Exchange. “Never in my lifetime have I seen both areas affected by freezes at the same time,” he said. The Florida freeze in early December will result in about half the yield of a normal year, and damage from the western Mexico freeze early this month is still being assessed, Brown said. Prices for tomatoes have recently doubled from about $15 for 25 pounds of Florida tomatoes, Brown said. The good news is the tomato shortage likely will ebb in late March, when Florida gets its next crop, he said. Meanwhile, the National Restaurant Association said the shortage is affecting eateries across the country. “A temporary shortage of any food item typically doesn’t spell disaster for restaurants, and there’s not much to be done about Mother Nature’s whims,” spokeswoman Annika Stensson said. But the lack of the red fruit might mean the BLT – bacon, lettuce, and tomato sandwich – will temporarily become a BL at some sandwich shops. Wendy’s restaurants late last week stopped including sliced tomatoes on hamburgers and chicken sandwiches except by request, spokeswoman Kitty Munger said. Wendy’s salads, which use grape tomatoes, are not affected, Munger said. Subway has seen a shortage of green bell peppers, as well as tomatoes. The sandwich chain is hoping to make up for the deficiency by including “additional varieties, shapes, and sizes, and will also receive produce from additional growing regions,” spokesman Les Winograd said. Supermarket chain Supervalu, which owns Jewel-Osco stores in the Chicago market, said it was hearing daunting stories from growers. “Some growers are reporting full crop losses,” spokeswoman Karen May said. The result will be produce shortages in stores for the next six to eight weeks. Products affected include tomatoes, cucumbers, squash, green beans, eggplant, peppers, and zucchini, she said. So…. needless to say, those tomatoes stayed as far away from my basket as possible… as I wished I had a “connect” on a veggie dealer or somethin’. I just… I’m a little sad. My pizza plans… were foiled. That’s what I get for trying to buy out of season, anyway. Just don’t be surprised when I write about sustainability. That’s all I’m sayin’. 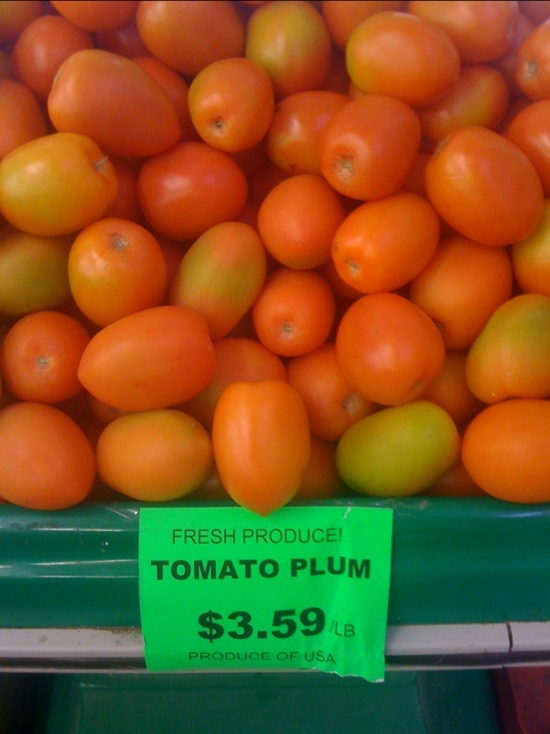 The price wouldn’t have stopped me at all but the fact that those tomatoes look unripe and not so tasty would. Have you ever thought about canning or do you own a food saver? I have the latter and it is fantastic. I will admit I am bad when it comes to spending money at the grocery store. My budget is always expanded when I see something like fruit I really want. I can see them being so inexpensive down in Florida and how that price would nearly make your heart stop. Could you do a post if you haven’t already on canning please? I personally want to learn more and have been reading on it. I think it would be a great post and I like your style and with all of the information you have on saving money it would fit in. If they’re supposed to be orange or golden tomatoes, they don’t look half bad…. Our local grocer had signs posted at the entrance about the crop damage, due to inclement weather. I give them props for giving us that heads- up. I think they knew drama would’ve ensued once people ventured to the produce area and noticed those outrageous costs. Shoot … between gas prices and cucumbers, my purse was feeling highly disrespected this week, lol. Two words: Farmer’s Market!! My daughter and I went this weekend and we found some great fruits and veggies and rock bottom prices. Nice prices on fresh bread too! Exactly why I’m growing my OWN this year (compliments of Topsy Turvy)!